Stop the killing of straycats in the city of Bruges, Belgium! Straycats are being killed because of ‘huntinglaws’ in the shelter of Bruges. Non profit organisation Kat zoekt thuis (‘Cat looking for a home’) has been neutering starycats for years in Bruges, at their own expense. Normally, this is at the responsibility and costs of the city counsel. In the past, we have had numerous contacts with the city counsel to improve the straycat-policy. Now, sadly, the city of Bruges is placing huntinglaws above animal welfare. Feral straycats are not neutered and returned to their habitat, they are being killed. Only ‘sociable’ straycats are being neutered and put back in their habitat, unless the neighbourhood wants to see them gone. Then they are being killed eitherway. Isn’t this just crazy? Cats that are sociable deserve a home! It’s the feral cats that should be neutered put back in their natural environment. They can no longer accustom to humans. There is no legal and definitely no moral basis to kill feral straycats. 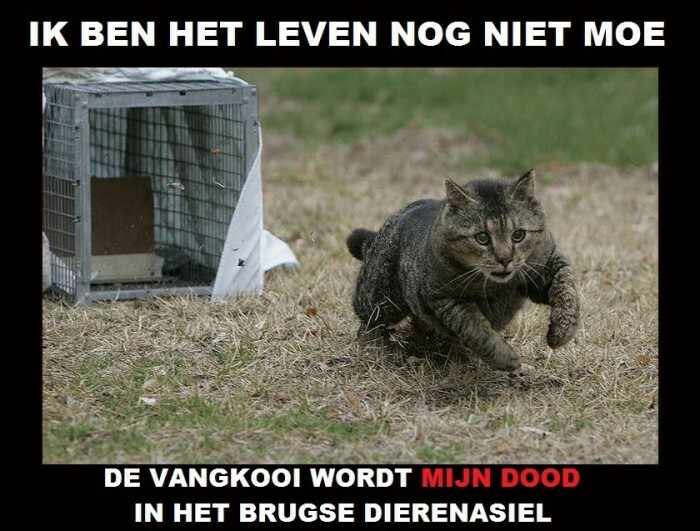 Because that is what happens in the shelter of Bruges, the feral cats are being killed! Bruges is one of the few cities in Belgium that takes animalwelfare back to the middle-ages, instead of having a modern TNR (trap-neuter-return) policy. Scientific research proves that TNR is the only way to keep straycat-locations under control. Trapping cats and killing them is not only immoral, it also doesn’t work! All our efforts from the past years (also financial!) are being destroyed. We ask the city of Bruges to STOP killing healthy straycats, starting now and in the future. We don’t want euthanasia for healthy animals, no more killing! This also means the shelter shouldn’t pick them up to let them ‘disappear’. This is not a straycat policy, this is murder! Dear people, please help us save the lives of the Bruges straycats. Sign our petition! The straycats of Bruges and us thank you from the bottom of our hearts! By signing, I authorize VZW Kat zoekt thuis en VZW Zwerfkat in Nood to hand over my signature to those who have power on this issue.